Even if you’re visiting Geneva briefly, this slice of Swiss perfection has plenty to offer the most time-conscious of travellers. As well as being a world centre for finance and diplomacy, the city has plenty of architecture and nature: from the blooming Parc La Grange to the Cathédrale de St. Pierre. 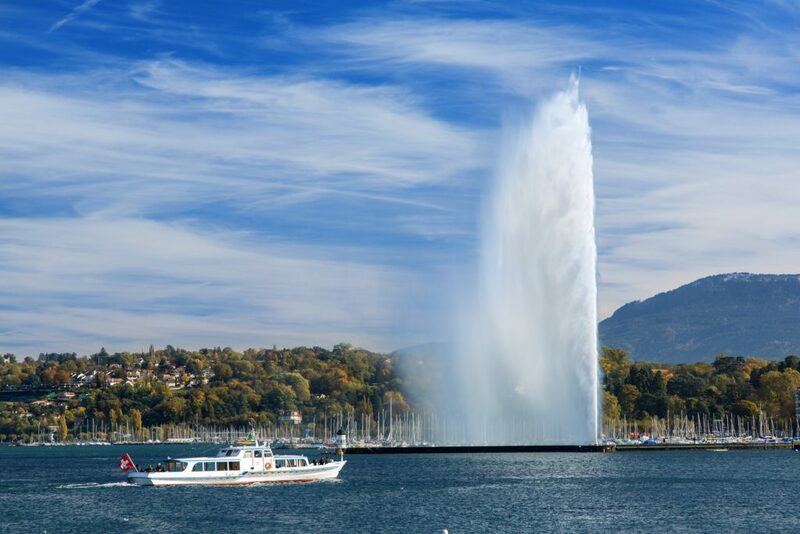 Here are a few tips to help you make the most of your short stay in Geneva. Taste what the region has to offer at the Les Recyclables Café. Head to the Les Recyclables Café on Rue de Carouge for a quick taste of local culture and produce. As a bookshop, café and a live performance space, this bright and cheerful venue offers a little escapism from the busy streets. When you get a little peckish, try one of their dishes made entirely from local and seasonal produce, or opt for a slice of homemade cake. The café becomes even more magical in the evening thanks to the twinkling fairy lights and the mixed sounds of animated chatter and international music performances. The area of Annemasse – home to the Les Papilles restaurant. Photo by Nicolas Nova. Geneva is certainly not short of places to eat. If you’re pressed for time head to the cosy and welcoming Les Papilles. Homely tapas-inspired dishes, brightly coloured walls and friendly service are the real standout features of this well-loved eatery. It also offers a large, international wine selection that you can sit back and sample on the terrace during the summer. If you’re stopping by, we recommend trying the beef: this succulent house special comes with crunchy homemade chips and vegetables for a light yet satisfying meal. 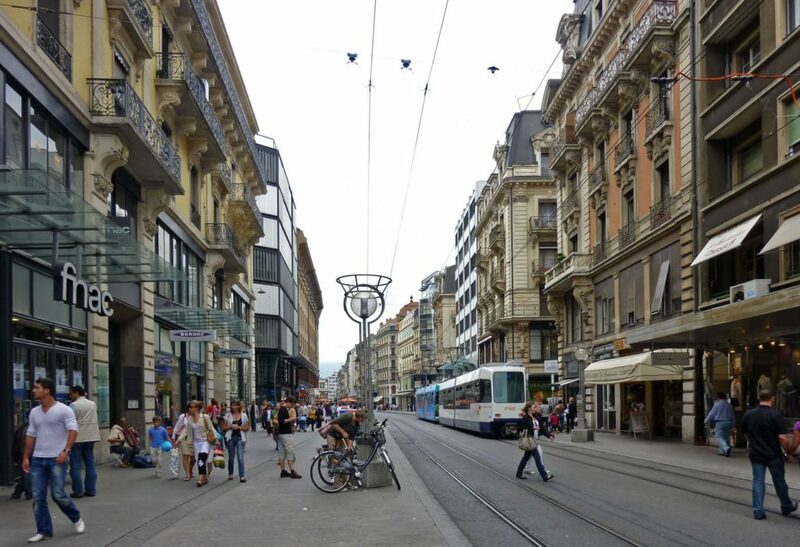 Window shop – or splurge – in Geneva’s boutiques and luxury stores. Photo courtesy of Payton Chung. Head to the Rue de Rive to browse the enticing (and high-end) boutiques that stock must-have clothing and accessories. This cobbled road is filled with quaint shop fronts and street trams, and perfect for a stroll. The shopping district is also rarely crowded, so you can wander and browse at your own pace. If you fancy pondering some bold and striking Impressionist and postwar art, the Opera Gallery Geneva is tucked down one of the side streets along Place de Longemalle. 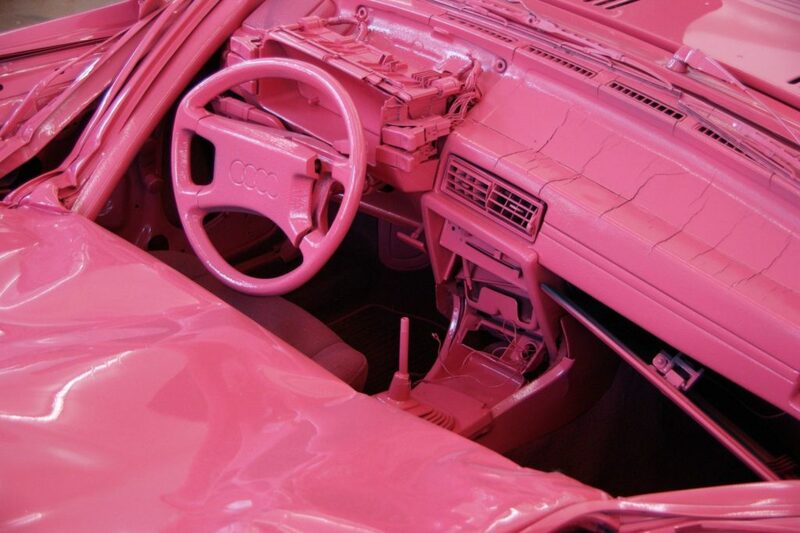 Visit MAMCO – the largest contemporary art museum in Geneva. Photo by Martin Abegglen. 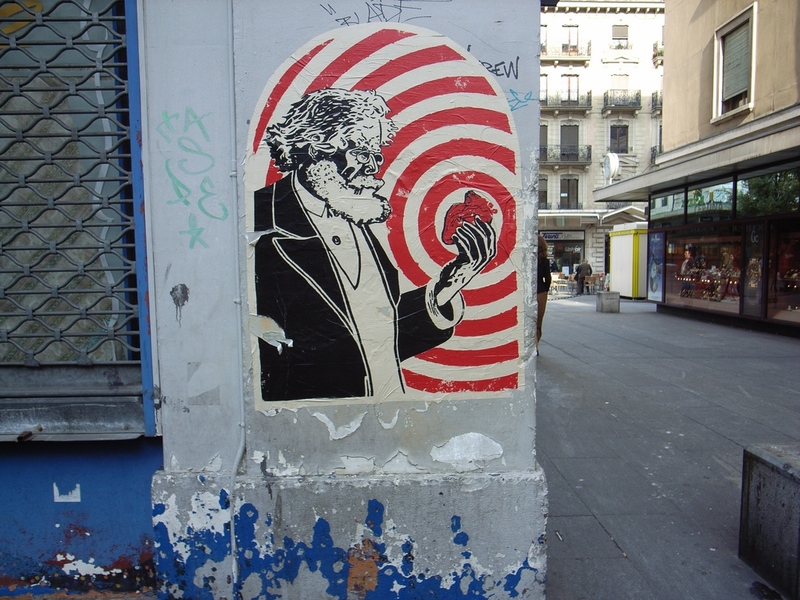 If you’re an art lover then this is one of the best places to visit in Geneva. Set in an old laboratory building, the MAMCO museum houses four storeys of modern and contemporary art including the Sherrie Levine and the L’Appartement collections. The collection – from both local artists and international big names like Acconci and Boetti– is the largest of its kind in Switzerland and it’s often home to temporary exhibitions of new works. There are guided tours available too, which are free on the first Sunday and Wednesday of every month (English language tours run from 7pm on Wednesday evenings). 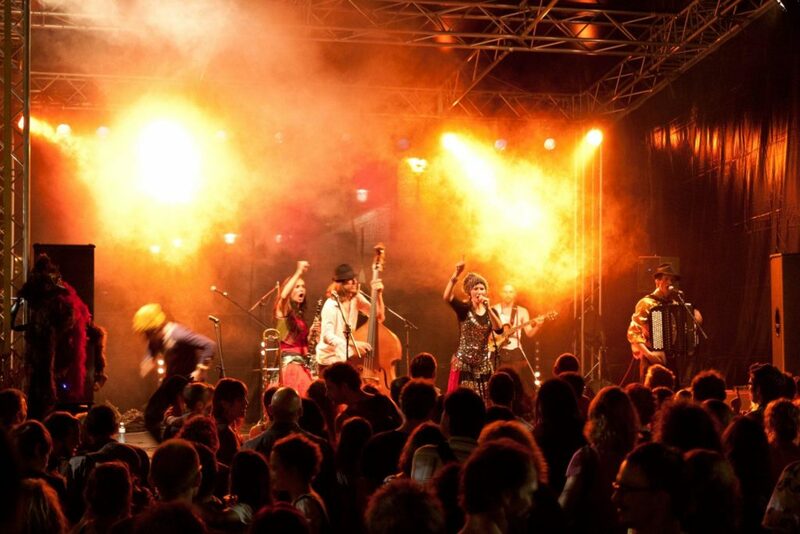 Enjoy the nightlife in the city of Carouge. Don’t let Carouge’s peaceful bohemian atmosphere fool you – it’s one of the best nightlife spots in the city. By day, you’ll find a charming collection of cafés and small galleries. Then by night, the cosy wine bars, nightclubs and speakeasies open their doors to offer a social hub where you can relax and unwind. Locals love Le Chat Noir for its hip atmosphere and live music events. Sit back with a tangy Bloody Mary, local beer or zesty wine and plan your night ahead. Or simply stay put – the venue is open well into the early hours. There are plenty of other options too, of course. A spicy shawarma from Bar La Tasse after hitting the tiles is just one way of rounding off your evening in Geneva. Stroll around Lake Geneva – and dip your toes in the glittering water too. When it comes to Geneva’s sites, the glittering sapphire lake should be top of your list. Lounge on its banks in between your travel or work plans, or hop on a cruise if you have a couple more hours free. A luncheon tour takes just over two hours and is narrated, so you can spend some time learning historical details about the surrounding area while tucking into a table-service set lunch. The menu varies depending on the day, but a few dishes that might crop up are juicy steak, tenderloin beef in burgundy sauce or Parmesan chicken. Cover photo by ITU Pictures.